Something showed up in the mail today. 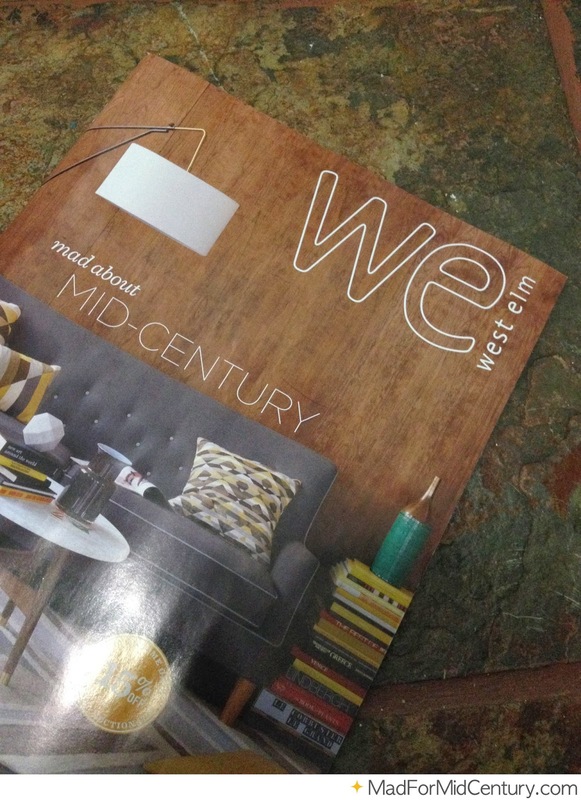 It looks like West Elm is mad about mid-century as well. 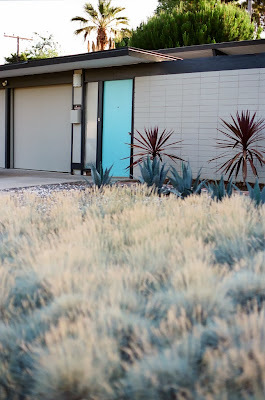 I'll always prefer actual mid-century furniture, but West Elm is one of those stores that's good for filler pieces or a temporary piece of furniture, while you continue to hunt down that Brasilia coffee table you've been looking for. 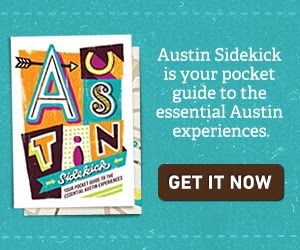 Looks like I've got some reading to do. 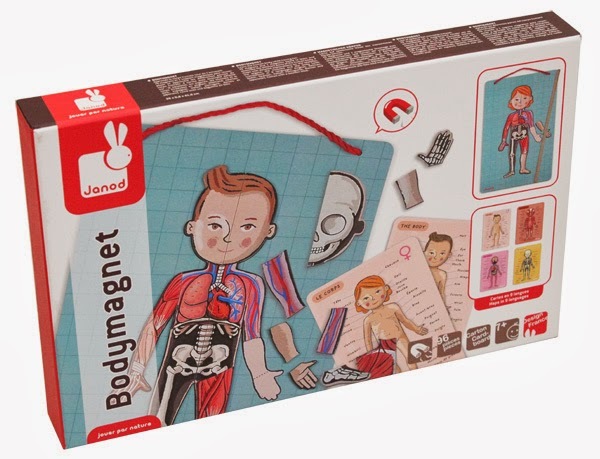 The Janod Body Magnet lets young ones build cute, kid-friendly versions of the muscular system, skeletal system, organ system and integumentary system. 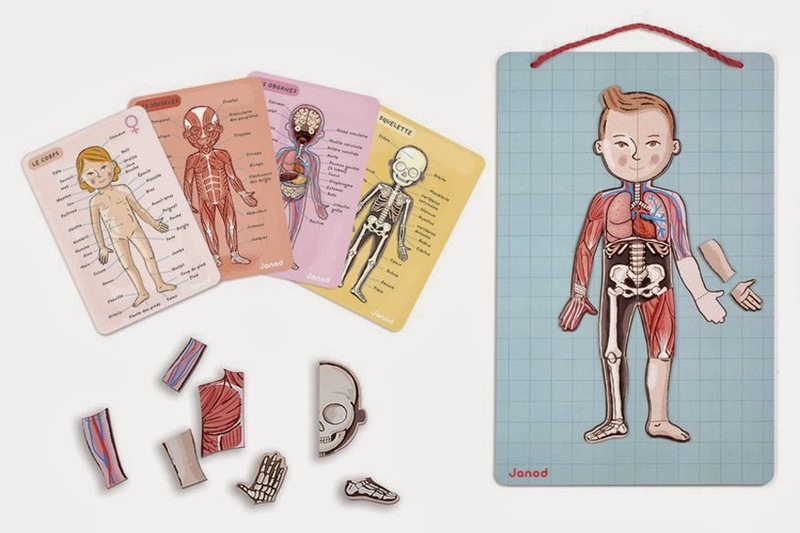 It's a handy little tool when kids start asking about their body. 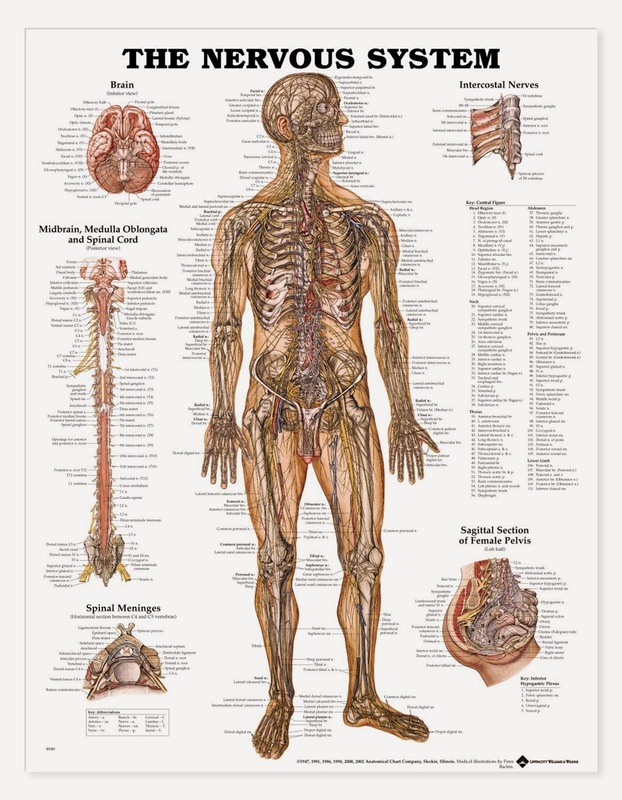 Which, I'm personally realizing happens a lot earlier if you have this (much more adult) nervous system anatomical chart hanging in your bathroom, like it do. 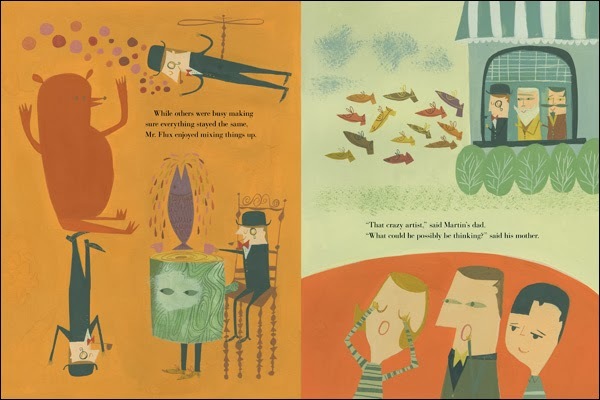 Kyo Maclear and mid-century artist Matte Stephens have come together to create the mid-century modern kids' book, Mr. Flux. 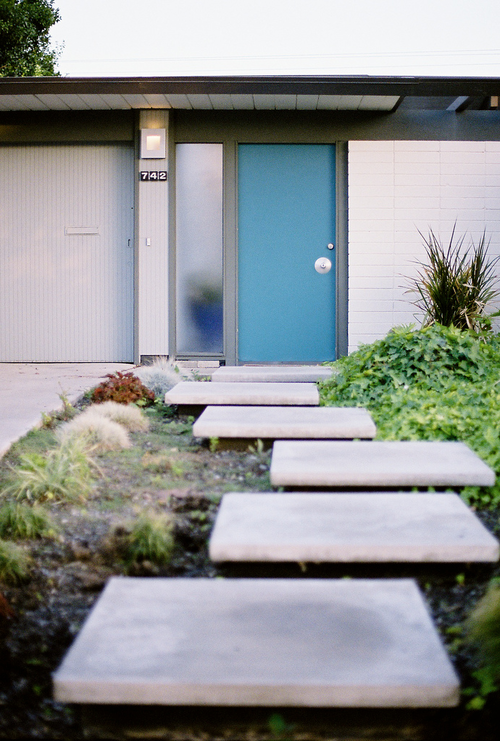 It's a fun little story about growth and change. And for the adults in the room, there's a (bowler) hat tip to George Maciunas, leader of the Fluxus art movement. 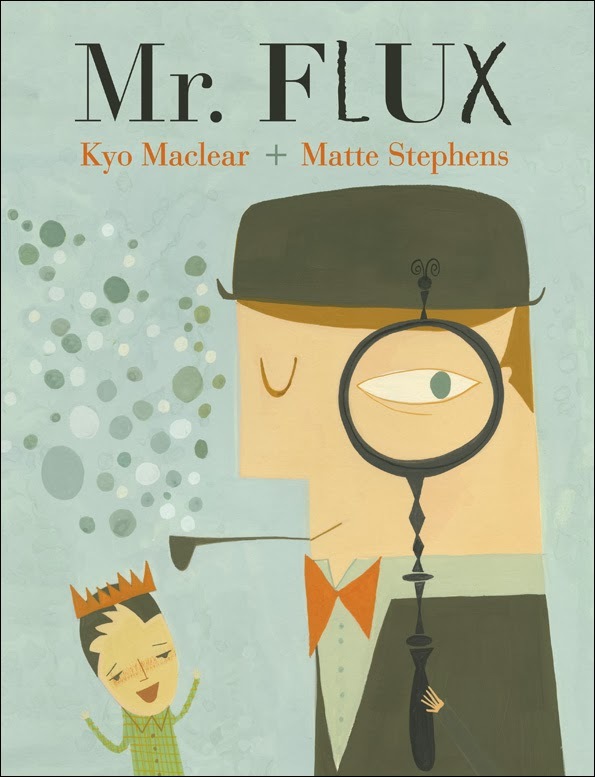 The Mr. Flux character is (loosely) based on him. 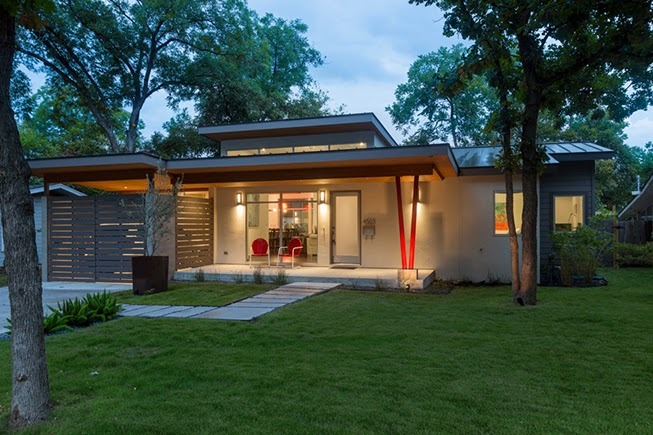 Tickets are available for the 2014 Austin Modern Home Tour. 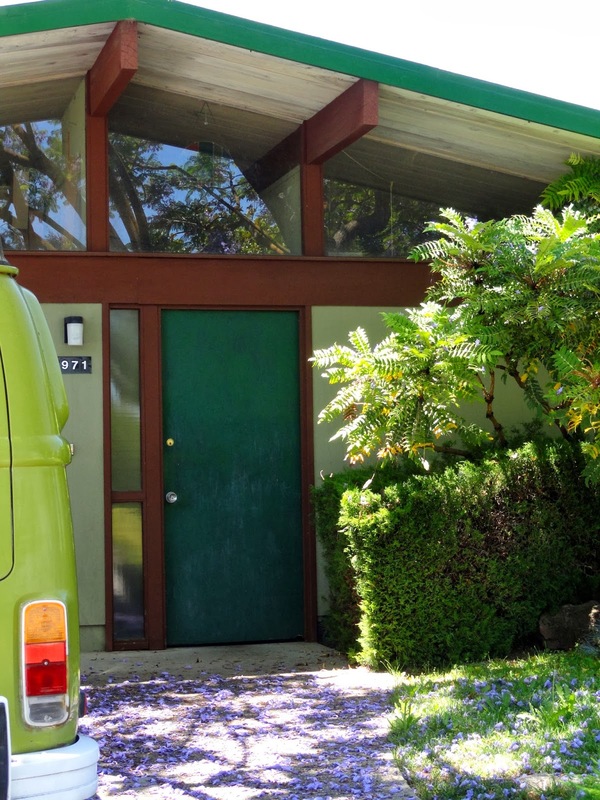 The homes on this year's tour look amazing. 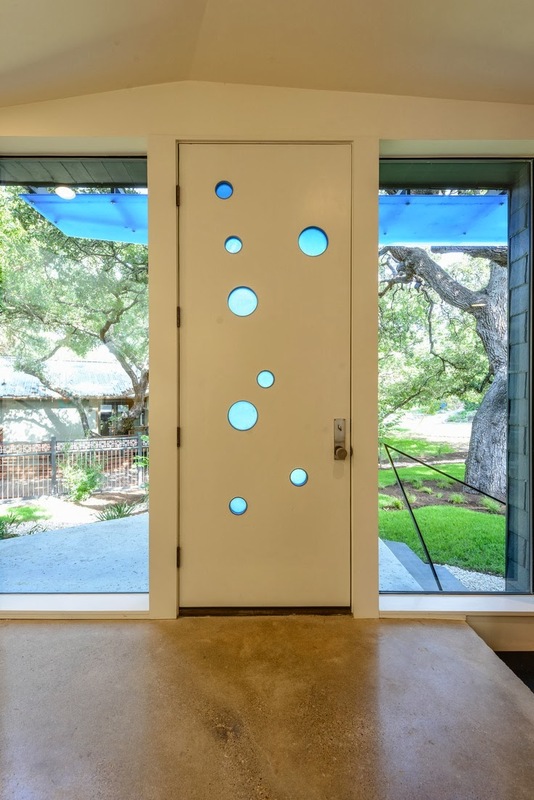 The tour takes place on February 1st and I can't wait to see more details like this mid-century modern front door with circle windows. A co-worker was giving away a few board games. 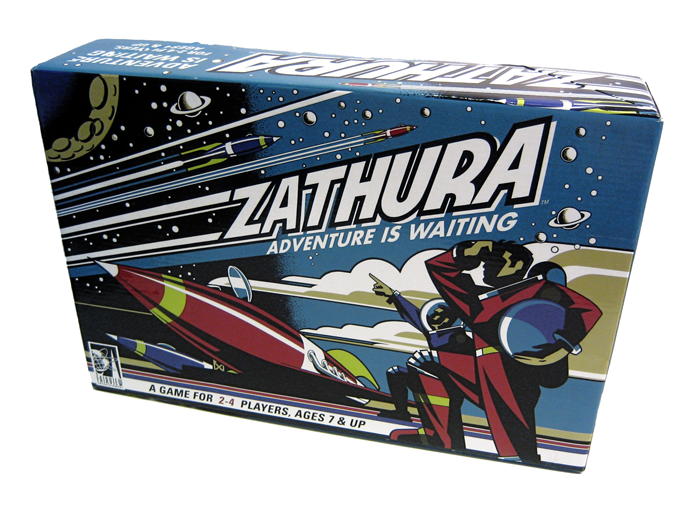 I picked out Zathura based on the box design alone. I haven't had a chance to actually play it, but the co-worker told me it was pretty fun. If it's half as good as the package design, it would be worth picking up at twice the price. 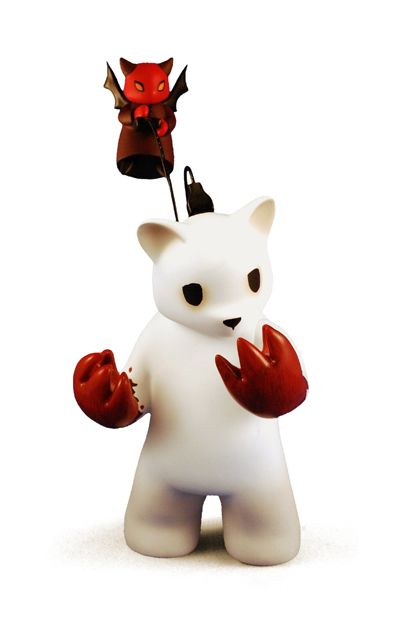 I can trace back my interest in lowbrow art and art toys to two simple sources. One was the day that I was flipping through Juxtapoz at a book store (remember those) and saw a photo of Possessed and decided that I had to own it. But before that, was the day I decided to find out who drew my favorite Cartoon Network cartoons, or at least who was behind the look that was driving those cartoons. 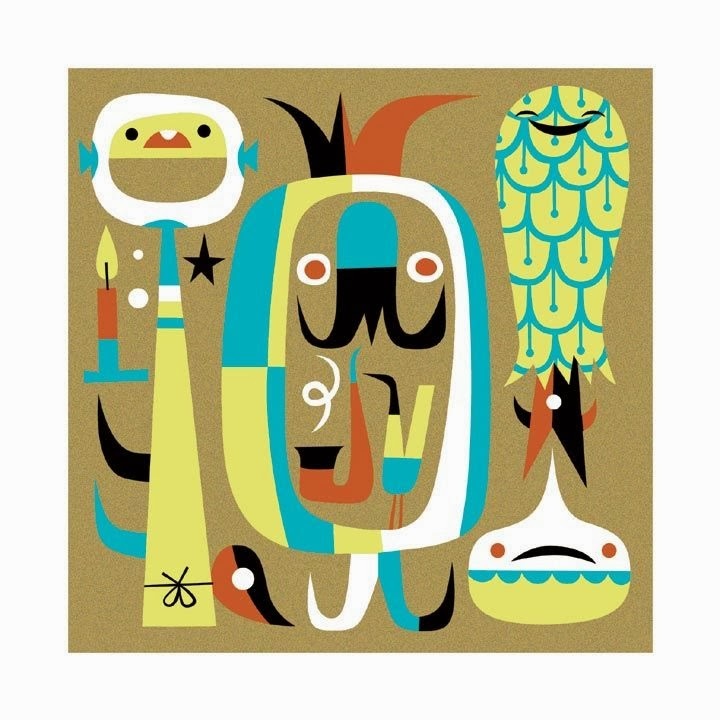 I fell down an internet rabbit hole that I didn't come out of for days, but I came out with an answer: Tim Biskup. As far as animation goes, Biskup is only credited on Dexter's Laboratory and Time Squad. But if you dig, you'll find his fingerprints on Samuri Jack, The Power Puff Girls and Johnny Bravo. And if you knew me in college, that was pretty much a list of the cartoons I would watch. 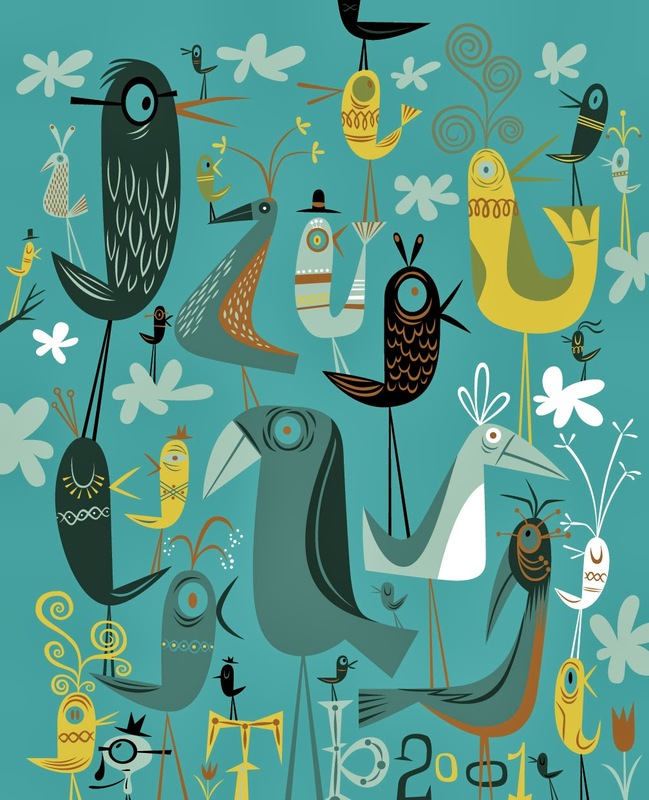 Biskup has also worked with Bjork, which, by itself, is enough for me to love his work. 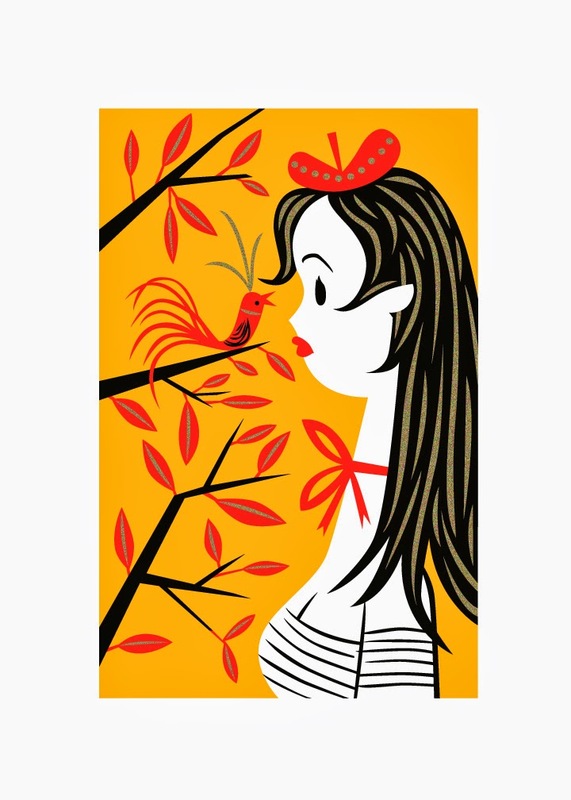 Biskup has explored a variety of styles and mediums, any one of which could be proudly placed in a mid-century modern home. 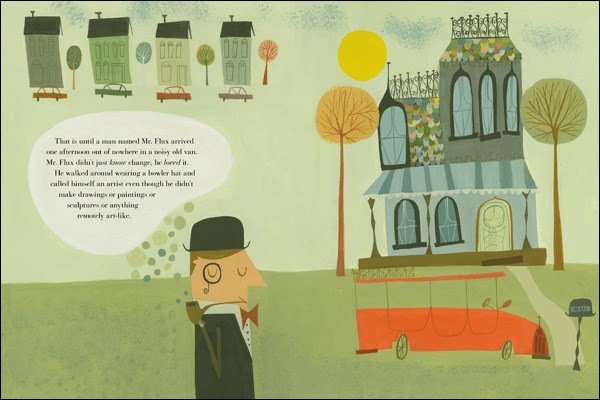 He's also the artist behind the modified Mold-A-Rama machine, the Roto-A-Matic. 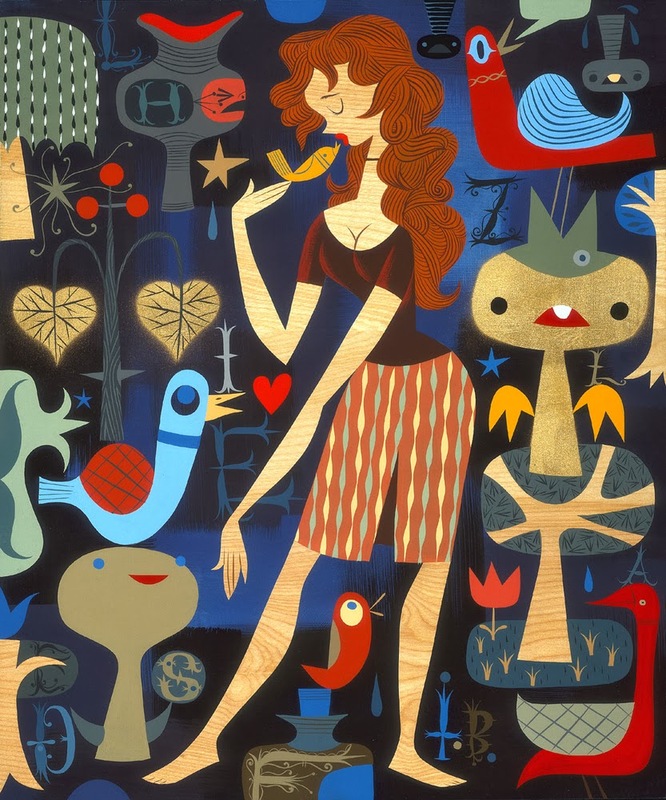 I've mentioned mid-century modern artist Matte Stephens before. 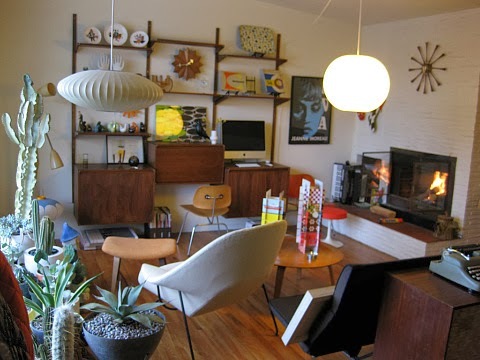 The Herman Miller blog interviewed him and took a tour of his home and studio. 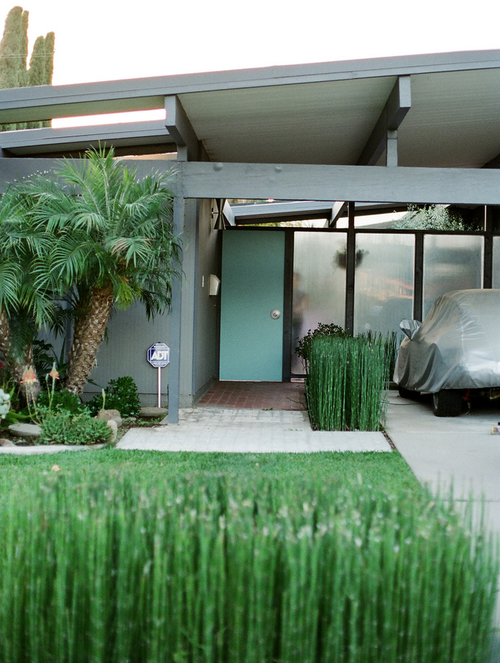 It's easy to see where he gets his mid-century esthetic and inspiration from. Why would you want to watch a 10 minute commercial about a camera from the 1970s and an instant film that no longer exists? 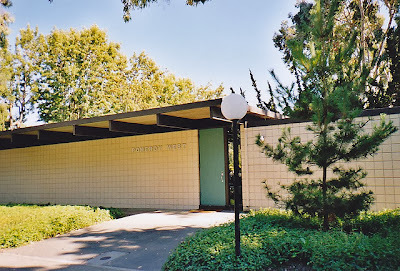 Because it was produced by Charles and Ray Eames, that's why. Once again, my interests and worlds have crossed paths. 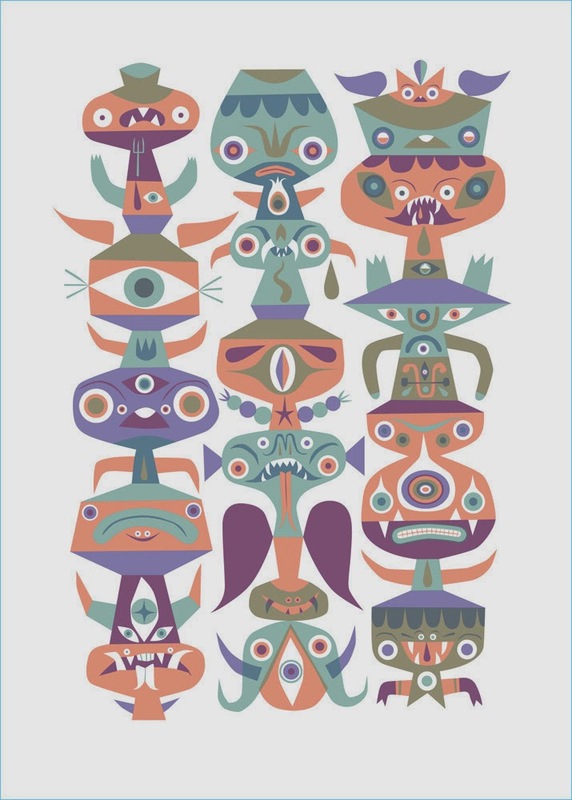 Tim Biskup, maker of the Tigetlily toy that sits on my shelf, and Rotofugi, an art toy store in Chicago, have modified a Mold-A-Rama machine to "mass" produce an art toy. The machine's called the Roto-A-Matic and it makes a Helper Dragon (a cyclops dragon with wings). Here it is in action. 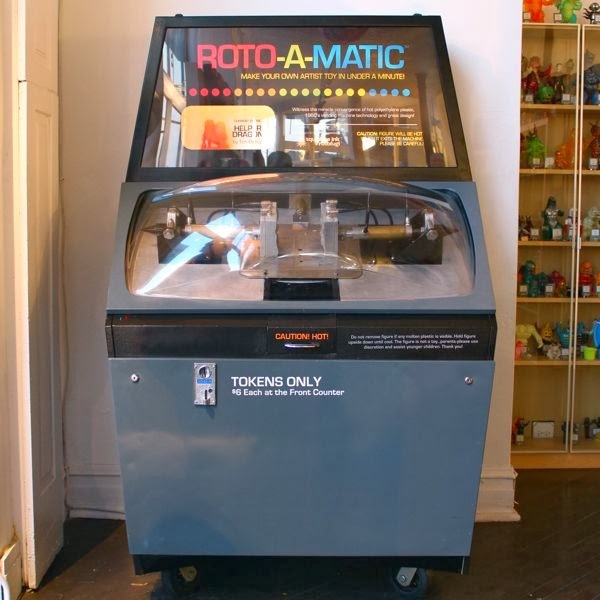 If you can't make it to Chicago, they sell the Roto-A-Matic toys online. 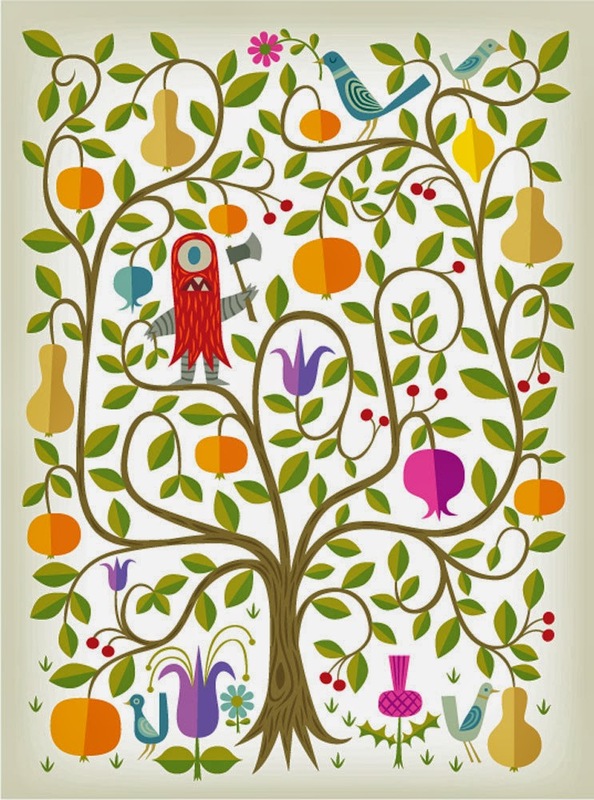 Colors change as Rotofugi swaps out polyethylene, so if you want them all, you're going to have to check back often. 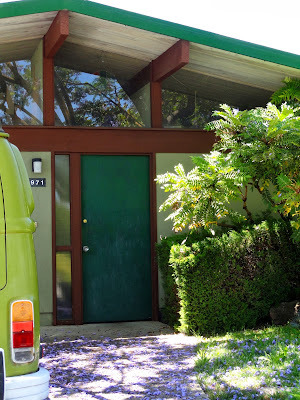 When we painted our mid-century modern door blue, we didn't realize how extremely Eichler it was. 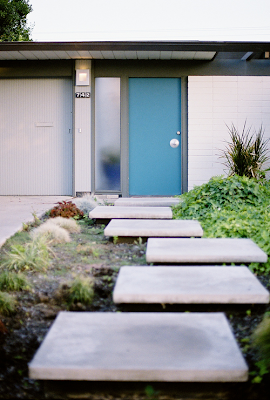 It makes me love our blue front door even a little bit more. I forgot that I took video of the Mold-A-Rama machine at the San Antonio Zoo in action. It's more impressive in person. But as a kid, the loud noises, crazy pumps and big steel blocks being pressed together all add to the experience. 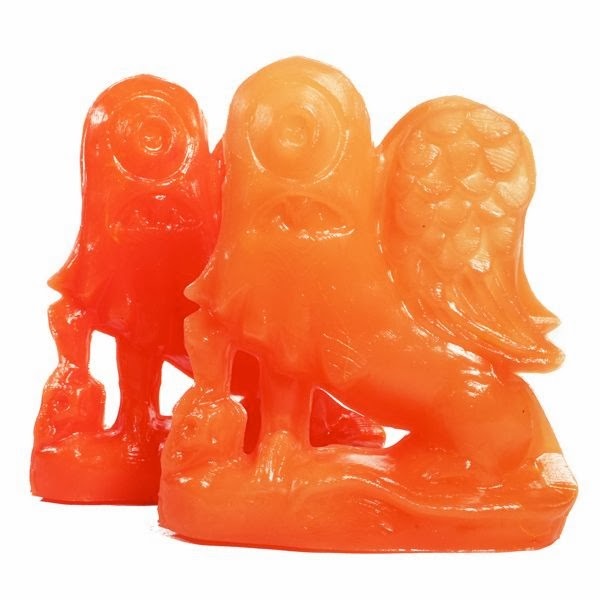 In the end, it seems like your Mold-A-Rama mold was almost made by magic. When I was a kid, every time we went to the Brookfield Zoo, we got a Mold-A-Rama figure. The evidence of that lives in our travel-theme nursery. 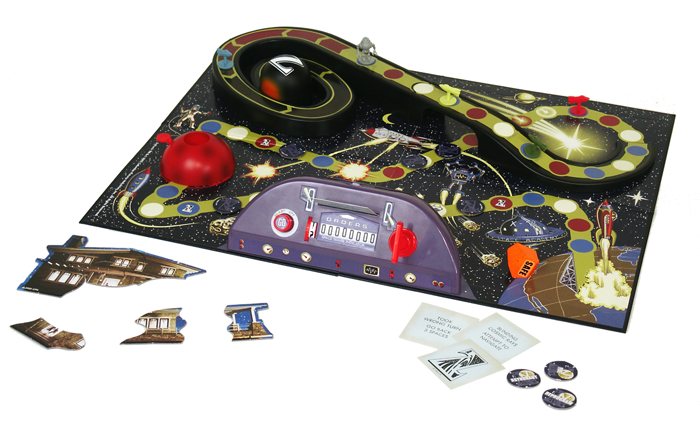 I also had a spaceship from the Museum of Science and Industry, but I lost that a long time ago. Needless to say, Mold-A-Rama machines hold happy memories for me. And as an adult, I love the mid-century look of them. So much so that at one point I was seriously looking into buying a Mold-A-Rama machine. But, when I realized it would have to live in the garage, I decided it wasn't worth the expense. I assumed they weren't out in the wild anymore, but we stopped by the San Antonio Zoo recently and they had a collection of Mold-A-Rama machines there. And a gray elephant (among other). All the details are as I remember them, especially the warning where you picked up your final mold. All the space-age dials are there. And the (now quaint) coins only detail. 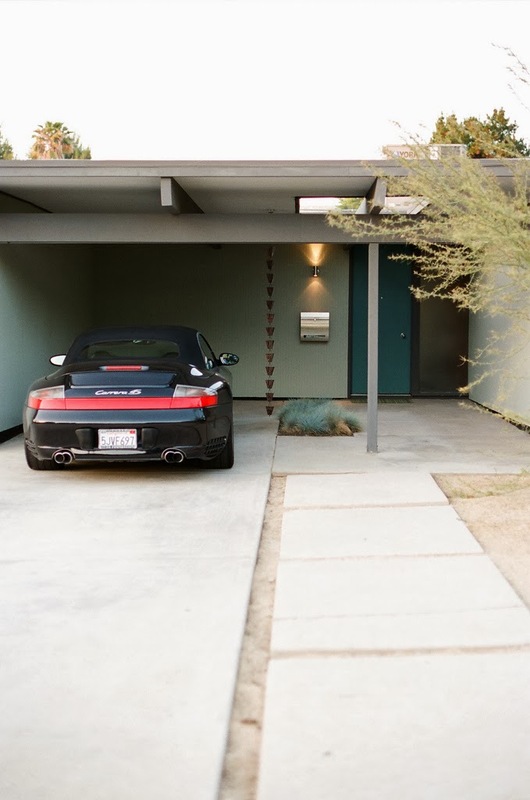 Because the price is definitely more modern. In the end, the kid wanted a giraffe (even though they don't have giraffes at the San Antonio Zoo). So we put this miniature plastic factory to work. And the kid got a giraffe. 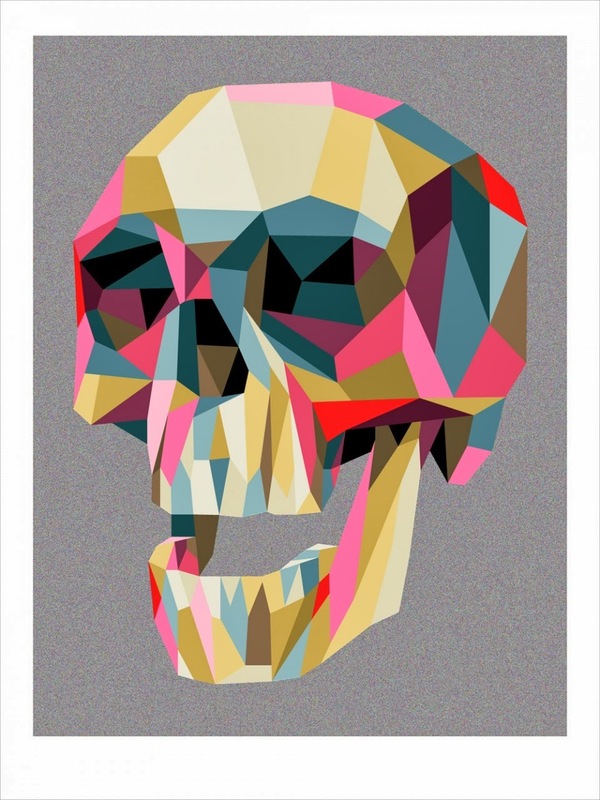 Here's what he looks like now that it's in our home. And here's what it looks like among my childhood collection of Mold-A-Rama molds. All of mine say Brookfield Zoo on the base, while the kid's says San Antonio Zoo. I'll have to make sure that every time we go to the zoo, another San Antonio base gets added to the collection.